A tutorial on how to link KuCoin API Keys to your Shrimpy account. Need help connecting Shrimpy to KuCoin? Make it easy to diversify and rebalance by connecting your API Keys to Shrimpy. So you’ve got a Shrimpy account, a KuCoin account, you know rebalancing could help you, but you don’t understand API keys or how to use them. Keep reading! What are API Keys anyways? An API key and API secret are like a username and password. These keys allow Shrimpy to communicate with the exchange in order to perform trades. Basically in order to rebalance and diversify your portfolio we need an API to talk to the exchange. KuCoin requires 2FA login and Security Questions before you can create an API key. Shrimpy allows for any number of exchange accounts to be linked to a single Shrimpy account. That means if you want to have 10 KuCoin accounts linked to Shrimpy, you are more than welcome. If you want to link 3 Bittrex, 1 Binance, 9 KuCoin, 5 Coinbase Pro, 7 Kraken, and 31 Poloniex exchange accounts, this is all possible inside a single Shrimpy account. 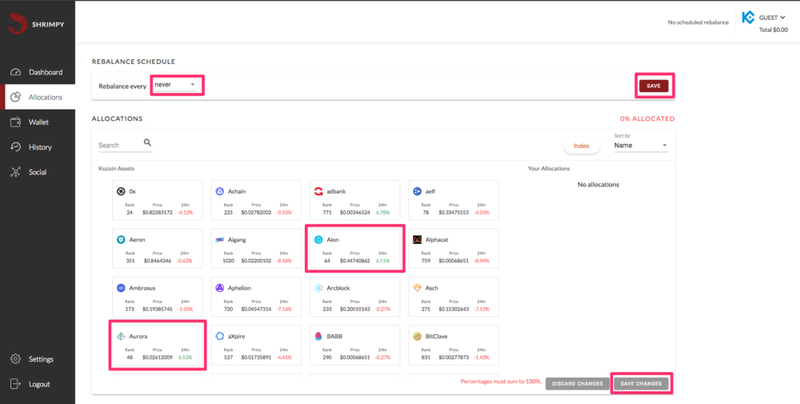 If you’ve already connected your API Key and would like to jump ahead, read about our research from over 200,000 tests on how portfolios would have performed with different numbers of cryptocurrencies. There’s a short summary at the end with a link to the research as well. Note: There are a number of confirmation and set up stages in-between each of these steps. Some of the missing steps include steps for setting up and entering 2FA codes. These were excluded because there were many of these intermediate steps. Step 1: Logging into your KuCoin account, you will see the following screen. Click on your profile icon in the top right and you will see a drop-down which includes "API Management". Log into your KuCoin account. Once you have logged in, click on your “profile” in the header. You can see in the above image and an option for "API Management". Select this option from the drop-down. Step 2: Now that you have selected to Navigate to the “API Management” tab. On this page, you will see the option to create an API key. Select the buttojn to "Create API". Step 3: A popup will display which will request you to name your API key and enter an API Passphrase. When you are creating your API keys, you will need to remember your API Passphrase. This passphrase will be used when you later link your API keys to your Shrimpy account. Step 4: The final screen you will see will look like this. Make sure you have enabled "General" and "Trade". The resulting permissions should look like the above image. “General” and “Trade” should be checked. “Withdrawal” should remain unchecked. Shrimpy does not require withdrawal access. In addition, “No limit” should be selected for “IP limit”. Using the “IP white list” option will prevent Shrimpy from being able to access data from your account. Now that the keys have been configured, the “Key” and “Secret” should be copied so we can input them into the Shrimpy application. Step 5: Navigate to “Settings” and then “Exchange”. This is where you will enter your KuCoin API key and secret. Once you have done this, select “LINK EXCHANGE”. Now, select “KuCoin” as your exchange and paste your “API key”, “API Secret”, and passphrase into the Shrimpy application. This can be found by navigating to “Settings” and then “Exchange”. Then, click the “LINK EXCHANGE”. At this time data should populate in your account dashboard. If it does not populate immediately, please allow up to 15 minutes for the data to populate. If it still does not populate after 15 minutes, please contact us at [email protected]. Step 6: Now, select your allocations you would like to maintain in your portfolio. Congratulations! You have successfully connected your API keys to Shrimpy. It’s now time to experience the exciting features that are waiting for you inside the application. Starting with the “Allocations” tab. Clicking this tab, you will quickly see there are a list of assets which are available on the exchange you linked. This is where you should select the assets you would like to have in your portfolio. These are the assets that will be bought or sold in order to reach your target allocations. The target allocations are the assets and percentages that are specified under “Your Allocations”. Anything that is not in your allocations will be sold in order to buy these assets. Essentially, treat this list of assets that you select as what you want your entire portfolio to become. Shrimpy will do the rest to reach this goal. Step 7: Click the “Rebalance Now” button to perform all of the trades necessary to construct your portfolio. The “Rebalance Now” button is the way you let Shrimpy know you want to perform trades immediately. Once you hit that button, it will perform all of the necessary trades to reach the target allocations that were specified on the “Allocations” tab. If your portfolio has already been created and is close to your target allocations, it will simply realign your allocations to match your target allocations.